Next step I started to work on the metallic and the brown leather parts, i decided to use true metallic on this figure. I used Scale 75 Heavy metal and black metal as a base for the metals. 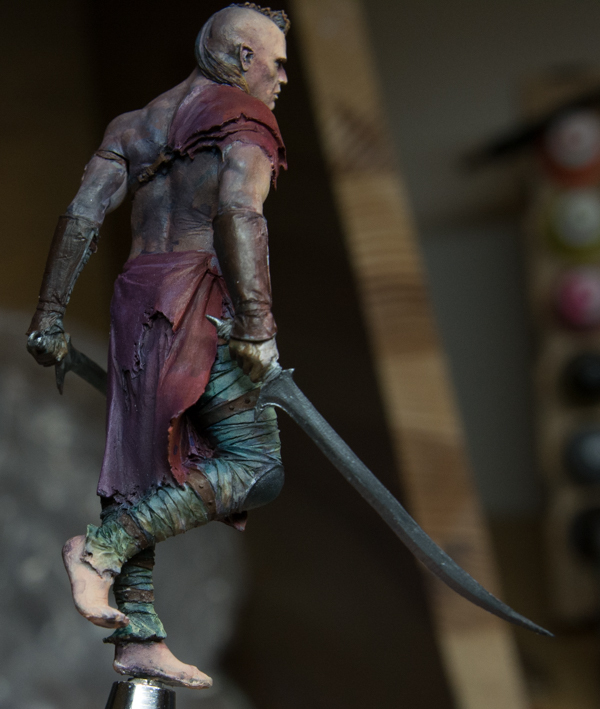 I also worked more on the bandages around the leg to give it more of a worn look on the front of the leg. Adding glazes of different colors from red, green and yellow. I have also continued the work on the base adding more warm colors to it, (will be more specific in the part covering the base.). Doing that work I realized that I need even more light on to the red cloth. I did go back with some stronger oranges and very light skin colors. That I later used a very light glaze to tone them down and make them part of the overall feeling of the cloth. Also in the metallic I used a lot of goldens high flow colors to make glazes to make areas more dark and also to get a lot of color variations, this since metallic reflects a lot of the areas around them and also should be warmer in some areas to give the feeling of the sun shining on them. I mostly used red, orange, yellow but also some green, darker blue and black in the shadow areas. 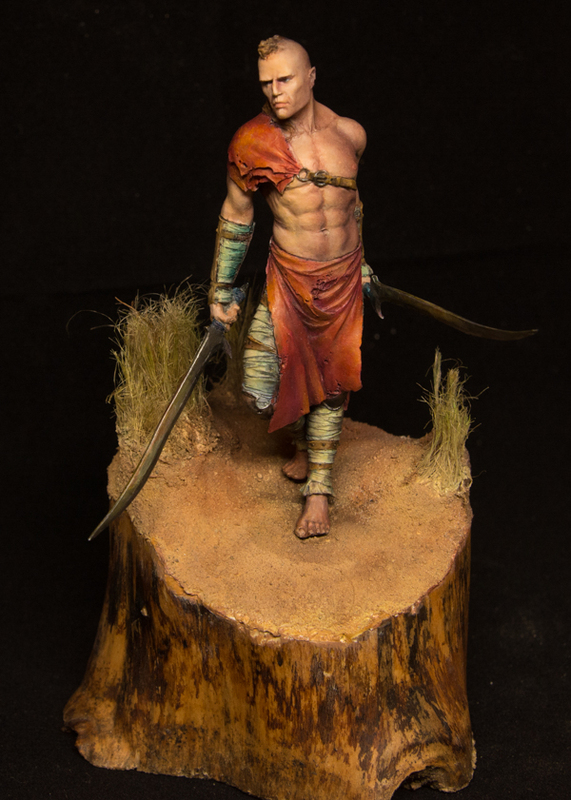 Final touch ups where made on his face, leather and feet. On the feet I made them much darker to belong more to the base also made them more “dirty”. Final words, I have learned a lot making this model come to life, also by writing this step by step I have realized and probably you also that I take way to little pictures to explain all the steps. I will take that with me and on my next bigger project I will take even more pictures to be able to show the progress more. Been fantastically fun to do this and hope someone else will have use of it. At least I have had help by doing this writing it gave me more focus and clear goals during the progress and I like the final results. Time to put this figure to rest soon, need to take some final pictures of him and write the step by step part of the base.